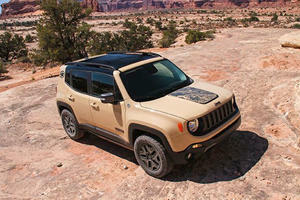 The Renegade is meant for rebels. Not the kind who ride Harleys and wear leather jackets, but the Blink 182-loving kids with spiked hair and nose piercings meant to piss mom off. 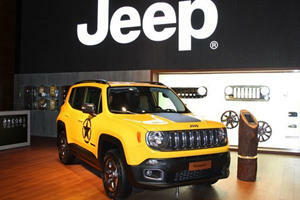 The styling is unmistakably Jeep, but it's softer and trendier than the Compass or Patriot that it replaces. However, the interior surprised me and every passenger with white, orange, and brown accents that really upped the cool factor. The cabin is roomy, much more so than the exterior hints. A quick drive around the block had me letting out a little laugh as I began to see what Jeep was on to. This car is fun, not in the way it drives but in its attitude. It's something an urbanite who wants to stand out from the Toyota/Honda CUV crowd could live with and maybe even bond with. It’s a good thing that the styling gave the car a fun personality because it’s driving sure didn’t. Handling wasn’t bad and a high driving position with car-like reflexes made city cruising easy, but the engine and transmission killed any prospect of engaging driving. My car had the 2.4-liter inline-four making 180 horsepower and was mated to a nine-speed automatic transmission. Sounds good on paper, right? In the real world a 0-60 mph run took 9.0 seconds. This meant that freeway driving called for strategic planning when merging lanes to accommodate for the time it takes the transmission to select which gear you need. Once it does, the engine sounds its loud droning voice before the seat nudges you forward. Not exactly thrilling. In the city the car was more bearable, but exploiting gaps in traffic required an all-out effort on the Renegade’s part instead of a simple extension of its capabilities. At least the technology made city driving easy. Inputs into the navigation system were fairly painless and switching between audio sources on the Jeep’s system made infotainment schemes from luxury automakers like Lexus feel archaic. A Beats audio system didn’t sound bad, but I doubt it sings better than a stock Jeep unit. Inside the realm of safety a lane departure warning system was no more useful than a good set of eyes, and a blind spot monitoring system beeped annoyingly when turning into intersections that had multiple turn lanes. I should note that the irritating beeps became useful in rush hour traffic when my attention was splintered in different directions. Parking the Renegade was easy due to a backup camera, sensors, and the fact that not much body lies past the front or rear wheels. It's easy to live with in the city, although the 17.5 mpg that I averaged seemed steep for a car that weighs 3,559 pounds. But once the work week ended the fun began, with a trip to the San Francisco Bay Area's Hollister Hills off-road park. We started on the easy paths and just five minutes into our excursion we encountered a team of lifted Ford Broncos and Jeep Wranglers towing a destroyed Dodge Ram that had flipped off of the trail and found its grave. Sitting in the cockpit of our tiny Renegade knowing that a much more capable truck had died on the trail was intimidating, but we persisted. So did our Jeep, because even though we didn’t have the Trailhawk version an optional 4x4 system was installed. A 101.2-inch wheelbase and 7.9-inches of ground clearance meant that the little Jeep made it all the way to the top of the hill. Its small body actually helped when the trail got narrow and it climbed over rocks, through mud, and into our good graces by proving that it has plenty of off-road capability built in. A nice perk was the removable roof that should make Wrangler owners feel at home. A few times we were stopped by trail goers in heavily modified trucks who were surprised we made it as far as we did. Off road, the Renegade was an object of interest rather than ridicule as plenty of grinning and muddy motorists stopped to ask questions. At the end of the day I got back on the freeway to go home with a newfound sense of respect for the little Jeep. It finally made sense. This Jeep is meant to capture a young (or young at heart) buyer who has a lifestyle that demands commutes during the week and off-roading on weekends to de-stress. 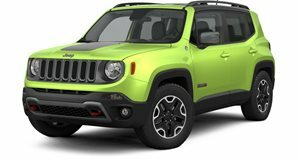 For a company that has a history of questionable build quality and frill-free interiors, the Renegade is an accomplishment because it rights some of those wrongs while keeping Jeep DNA in its blood. It's not brilliant, but as much as I wanted to hate it I simply couldn't. But wait, didn't Jeep's CEO say the opposite just a month ago? Millennials love decals and the color black, right?! Zombies, a Jeep and a boy band member = scary.